If you can afford a walk-in closet, you should definitely consider incorporating one to create a superbly organized dressing area. Anyone who owns an impressive collection of clothes and accessories can’t really organize them and display them properly without the help of a nice walk-in closet. To create the ideal walk-in closet, there are a few things to take into account. The primary issue is space as you need to find an area with great functionality potential. Then it’s simply a matter of integrating various creative ideas to obtain the desired look and feel for your walk-in closet. Let’s see what are the best ideas and space-savvy strategies to take advantage of this powerful organizational system. The walk-in closet of your dreams will be easier to create if you follow our tips and tricks. 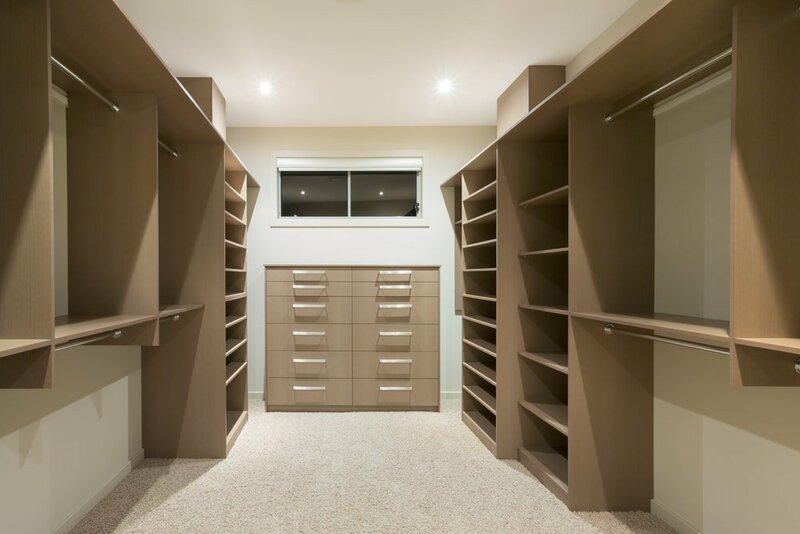 When you design a walk-in closet, you need to be aware of the various shapes you can choose. By selecting the right shape, you can work more efficiently with the available space. For those who wish to have the best storage possibilities, it’s best to stick to a U-shaped closet. If you need some breathing space, try going for an L-shaped closet. 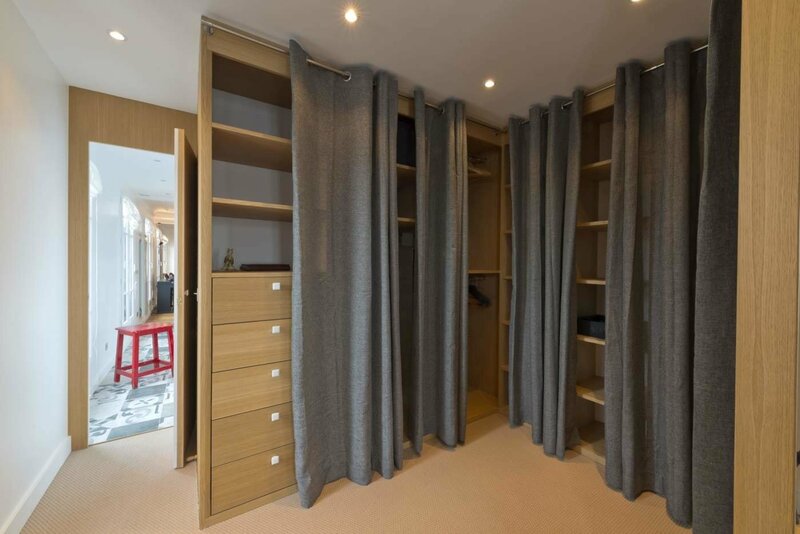 One of the simplest designs to incorporate is the straight closet style which works ideally for small spaces. Regardless of the shape you choose, it’s recommended to leave some room for a seating area or future plans of expansion. 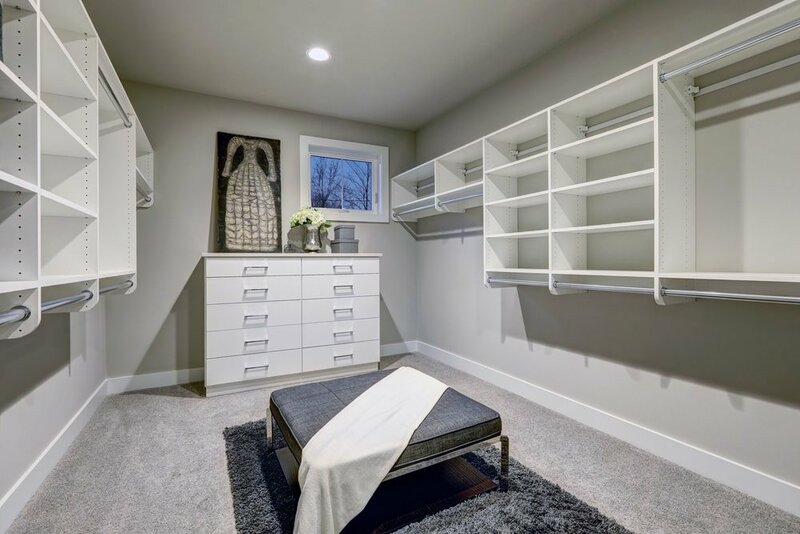 Considering how walk-in closet are usually designed to be used just by a single person, this means you can let this room show off your personality. That can often translate to adding a pop of color instead of choosing a monotone color palette. This is a personal space that can reflect your creativity, so if you’re not a fan of neutral colors, don’t be afraid to paint the walls in your favorite color. The main function of a walk-in closet is to store all the contents of your wardrobe. It’s important to try to bring in some more ingenious storage solutions to organize a large number of items with ease. You should be able to find the clothing piece or accessory you need when you enter the walk-in closet. Drawers are helpful to offer some extra storage and keep your stuff free of dust. They’re particularly great for holding your favorite jewelry pieces. There’s also the need for plenty of shelving and cabinets as well as a generous hanging space. 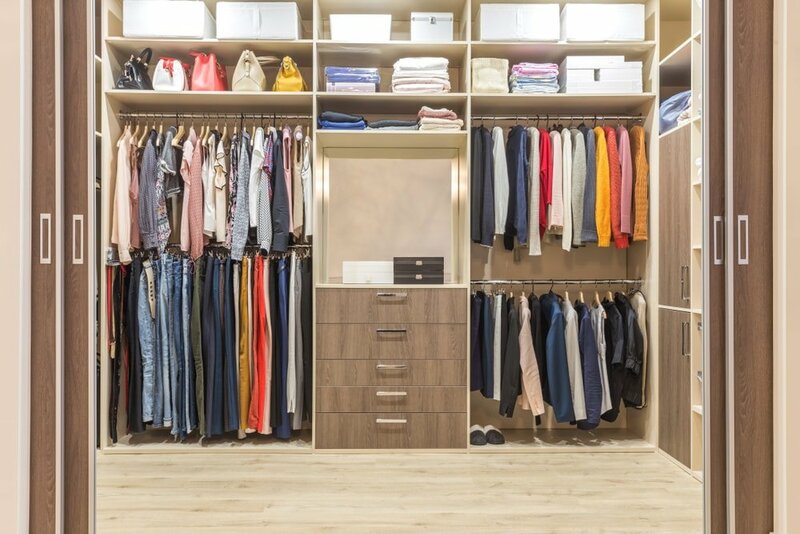 The best way to keep your walk-in closet uncluttered is by having great storage options. The seating area is almost mandatory to include for a walk-in closet. Trying out shoes or placing various outfits are greatly simplified with the help of a chair or an ottoman. In fact, one of the best options to include in your walk-in closet in terms of seating would be an ottoman with included storage. A practical model can be found on Amazon. If you have some extra space, consider adding a larger seating piece like a bench with storage. Here’s a comfortable model with linen upholstery. One convenient addition for the walk-in closet is the dressing island. This can become your favorite spot for placing some things that you plan to use or try on. Many models come with generous storage options such as multiple drawers and you can also improve their organizational potential with extra trays or boxes for accessories. The only downside to this idea is if your walk-in closet has limited square footage and doesn’t really allow for a center island. If you decide to give it a shot, make sure you choose a dressing island that reflects the style of the closet to create a pleasant look. 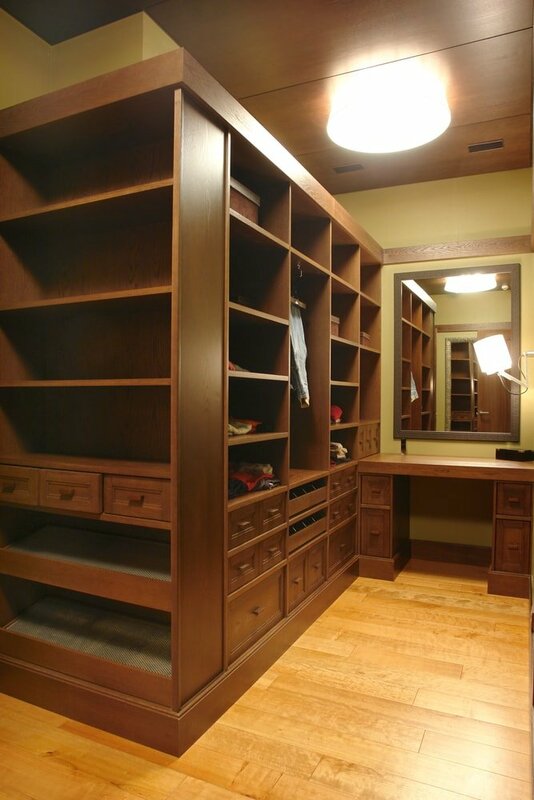 Walk-in closets don’t necessarily have to be these big and luxurious spaces that give off some overwhelming feelings. 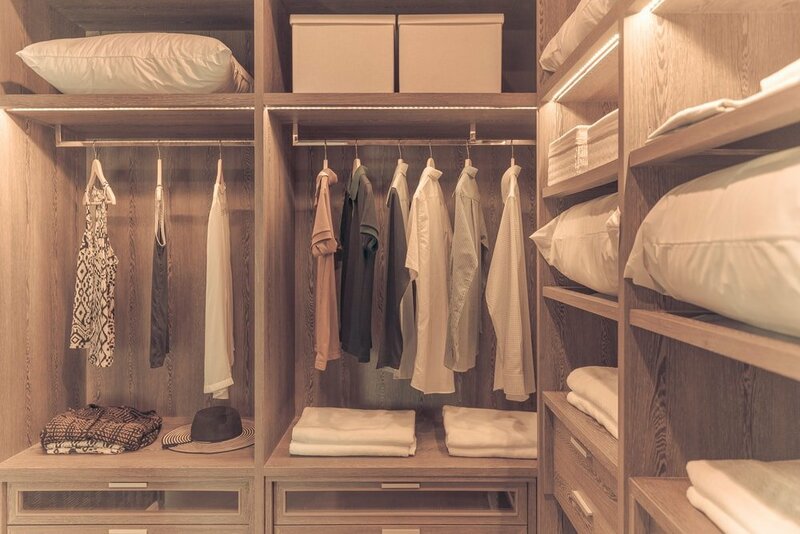 You can also have a minimalist walk-in closet that’s just as effective for proper organization of your items. With a bit of effort, you can create a simple and effective little spot to store your modest collection of clothing and shoes in a space that provides some fresh and airy vibes. 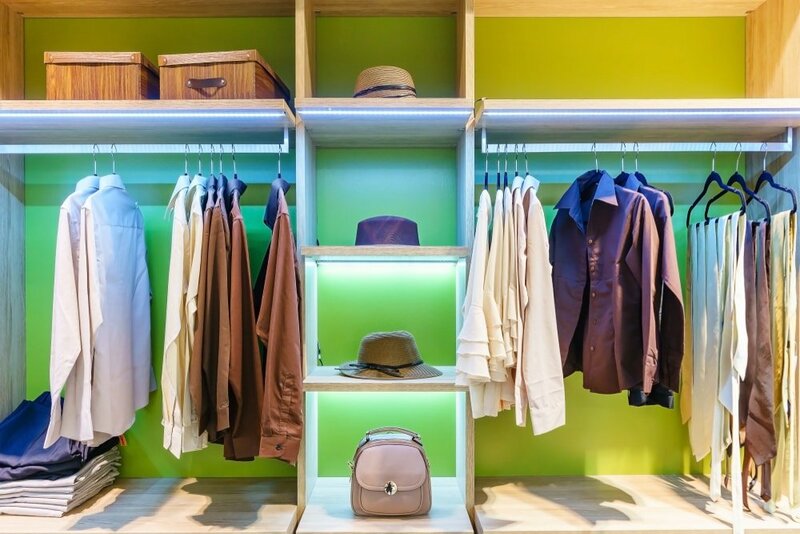 Good lighting is a key element for having a successful walk-in closet. When used correctly, lighting will be able to set the mood in this area and enhance the atmosphere of the entire space. 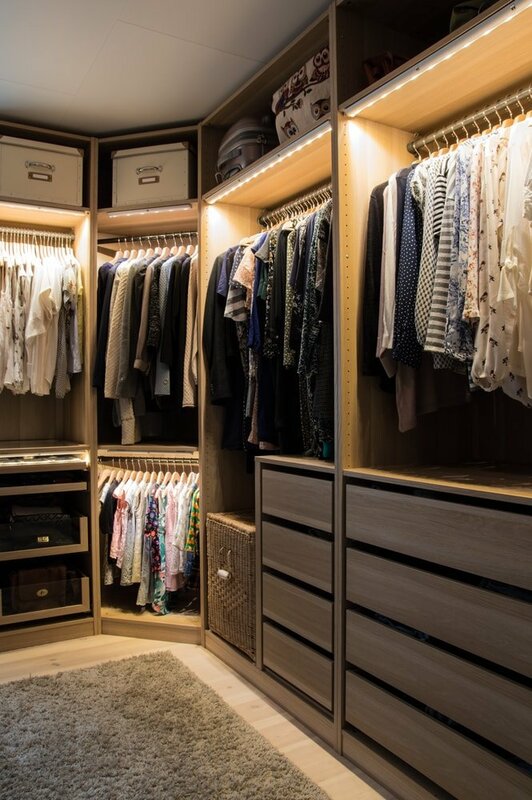 There are multiple methods to incorporate lighting in useful and elegant manners in a walk-in closet. If you decide on showcasing some particular items like jewelry or other accessories, consider adding some focused lighting to make them stand out. 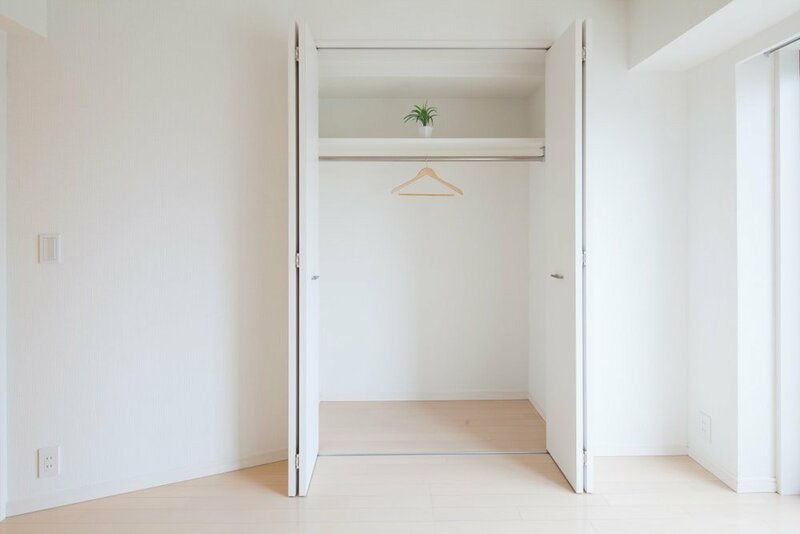 As most walk-in closets don’t usually have windows, make sure you take care of the room’s brightness to reach adequate levels. Various other solutions such as ambiance or task lighting can also complete the overall picture of your beautiful walk-in closet. 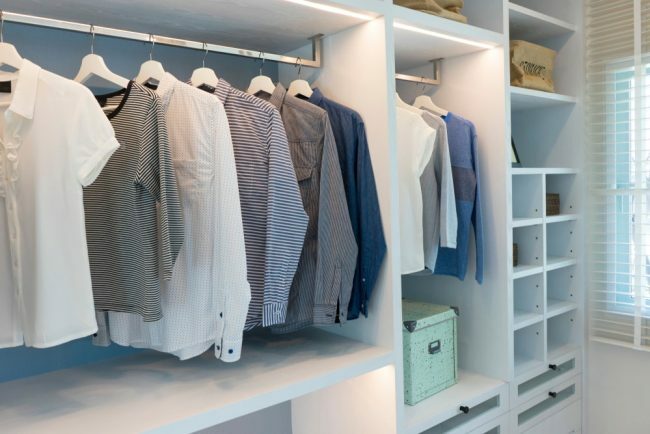 Task lighting represents a clever solution to use illumination and emphasize certain key areas of your walk-in closet. It will make finding the right outfit a breeze thanks to its brilliant highlighting ability. We recommend some under-the-cabinet lighting solutions like this pack from Amazon. This is a great example of lighting that accomplishes a specific purpose. Accessories are some of the most treasured possessions you have so it’s a good idea to display them properly. There are lots of options when it comes to jewelry as you can use racks and retail displays. If you own lots of little accessories you can keep them organized more easily with a stand-alone jewelry armoire. Take a look at this amazing jewelry cabinet from Amazon which features a great storage capacity, LED lights, and a mirrored door. The shoes can be showcased in a more innovative way with the help of a bookcase like in this picture. Place a chair and mirror nearby to be able to easily try out any pair of shoes on display until you find a matching one for your outfit. Another solid option is to use slanted shelves. In any case, having enough space for accessories is a must for a complete walk-in closet. 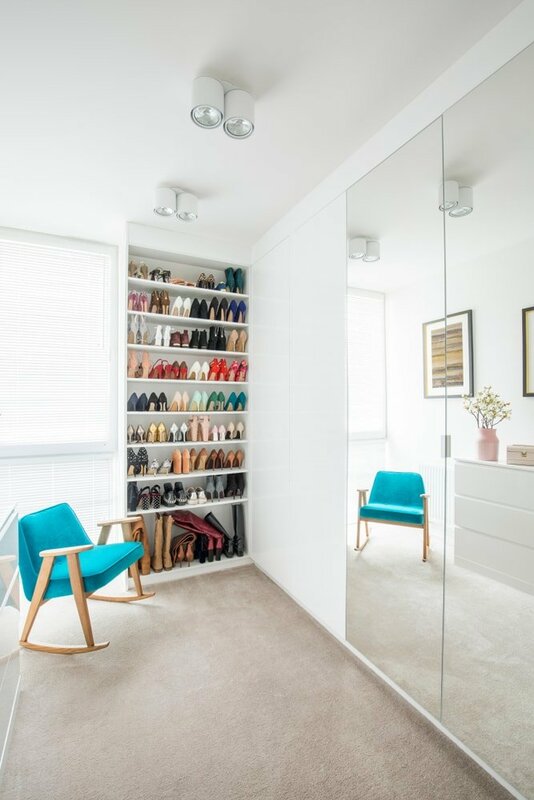 Mirrors are vital items to have in any walk-in closet. You need to be able to see yourself when testing out some new outfit combinations. Another option is to integrate multiple mirrors in the closet doors and create an enlarged space effect thanks to the light reflection. 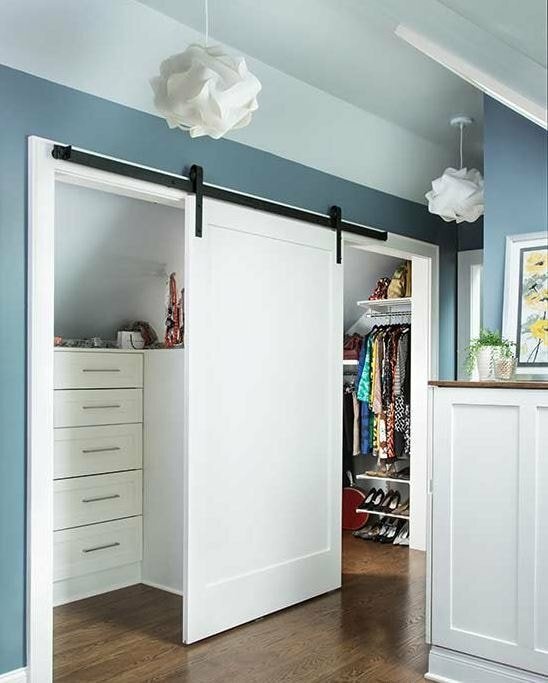 This is could be helpful when dealing with smaller walk-in closets. A relatively newer addition for walk-in closets, the vanity represents a nice component to include as you’ll most likely need a dedicated space for doing your make-up. Why not include it in the walk-in closet if the area is spacious enough? The vanity section should contain a countertop with plenty of drawers for storing all your make-up supplies and other tools. Comfy seating and reliable lighting are other essential components that you shouldn’t forget. A large static mirror could be the last missing puzzle piece from your vanity section. It’s not mandatory though, as even a portable mirror should suffice in most cases. 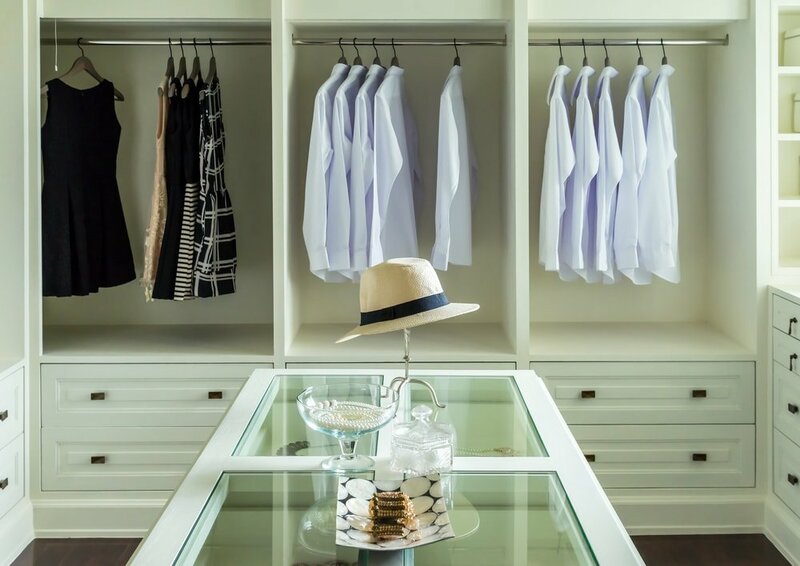 White is a popular option when it comes to choosing a walk-in closet theme. The reason for that is quite simple. Your clothes will pop out thanks to the resulting contrast making for a crisper impression. You could say that white is an ideal backdrop color for a walk-in closet. This color is also recommended if you want your dressing area to give off the feeling of a clean space. Bringing a more personal touch in the walk-in closet is always a nice idea. This is a functional space in your home, but that doesn’t mean it shouldn’t have an aesthetic role as well. 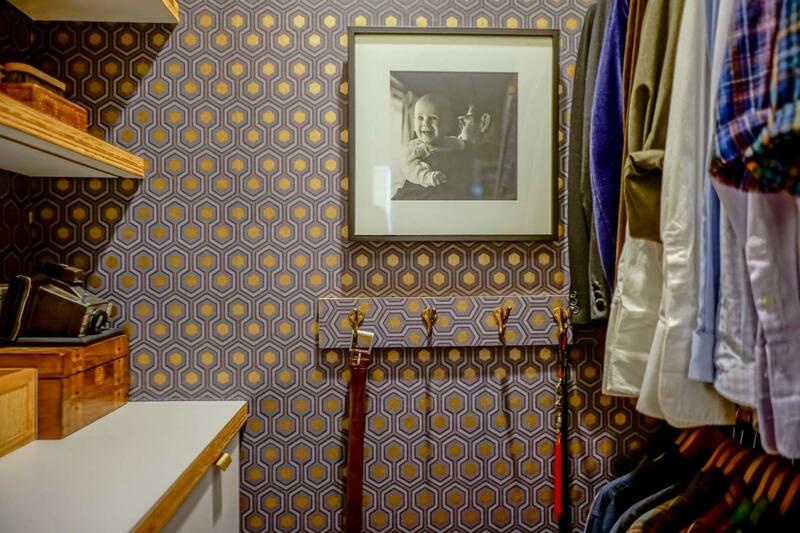 Getting your hands on some expensive wallpaper might not be suitable for a large living room, but a compact walk-in closet will definitely benefit from it. This is a lovely example as the wallpaper fits into this small walk-in closet without issues and provides a fresh patterned look. This is one spot where you’re allowed to enjoy some luxury vibes and the right wallpaper can achieve that. While it may seem surprising to some that washers and dryers can be found in walk-in closets, that actually makes perfect sense. These appliances belong here considering how you no longer need to carry laundry back and forth. By installing the washing and drying machines here, you can create a more convenient placement for them and simplify your laundry chores. This is obviously not an idea that can be applied by anyone given how certain walk-in closets will have space constraints. In that case, you should at least consider the addition of a laundry chute that can still make your life easier when doing laundry. Your closet space can be utilized more efficiently if you separate it into areas where you store a specific category of items. Shoes belong in some spots while other items such as bags belong in other designated areas. By respecting some simple organizational rules, you’ll be doing yourself a huge favor when it’s time to find anything in the closet. There’s also the fact that proper organization improves the visual appeal of the space. Take the category separation a step further and color coordinate your items for reaching that sought clothing piece or accessory in record time. If you’ve decided for a long and narrow shape when designing your walk-in closet, this gives you the perfect opportunity to add a runner. Sometimes a simple accessory like this is the last missing piece to complete the look of the walk-in closet of your dreams. This room appears to be so much warmer and attractive with the help of this runner rug with playful patterns. One of our favorite models to decorate the walk-in closet is this stylish runner rug from Amazon that brings a fresh pop of color to any place thanks to its modern abstract design. 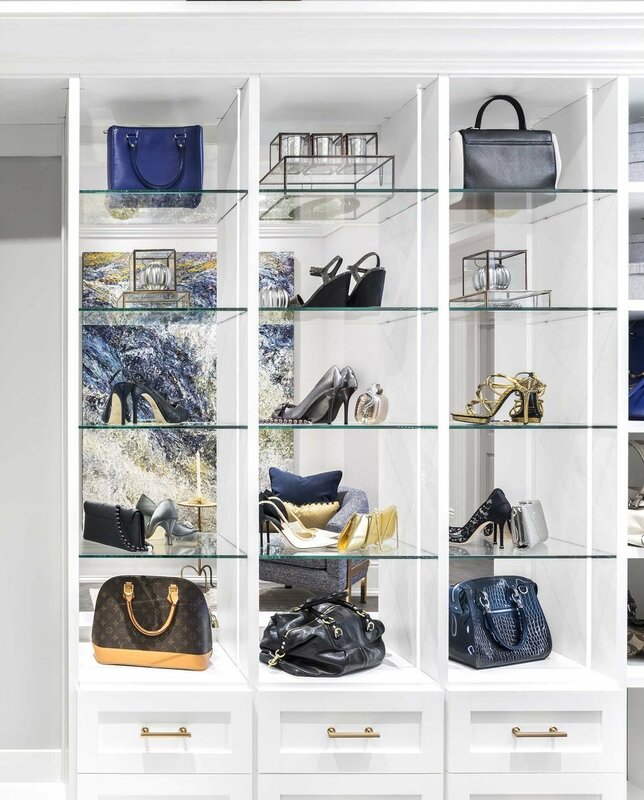 For an authentic boutique-look, save up some space in the walk-in closet for accessory shelves. The glass boxes here look absolutely fabulous and they can truly take the elegant vibe of the area to a new level. This might be an expensive idea to try, but it may not be as complicated to implement if you just rethink your bookshelves. 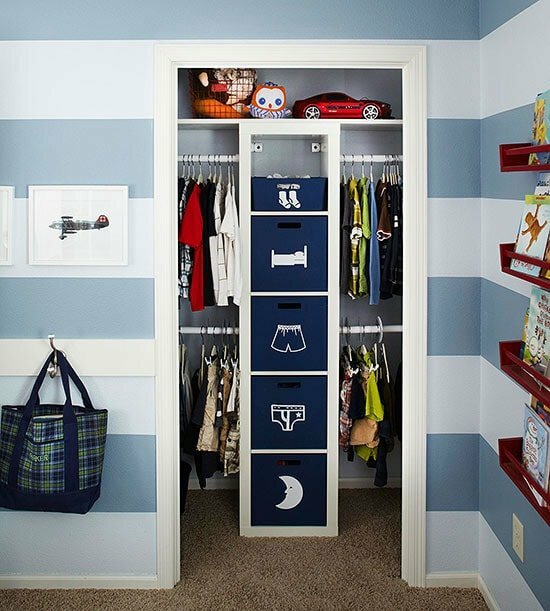 Walk-in closets aren’t just for adults. You can create a small, custom dressing area for your children. This is a great example as it also makes use of some clever organization features such as the drawn figures on the pullout bins. Multiple sets of hanging rods handle small clothing items and they can be modified once there’s a need for storing larger shirts and pants. Once you’ve obtained a walk-in closet look that you’re happy with, you also have to consider whether you prefer an open area or not. Some walk-in closet designs permit a more open effect but many people prefer to keep this area out of everyone’s view. A good compromise between these design styles represents the mounting of a sliding barn door. Your walk-in closet can be hidden when you need to or you can have it ready in a more accessible state by leaving the sliding door open. It doesn’t matter if you’re not a fan of the rustic farmhouse look as a bit of paint can transform any barn door with a modern flair. Another method you can try to keep the look of your walk-in closet simpler is to hang some curtains. Choose some neutral-toned models or monochromatic greys for a minimalist style. Sometimes, no matter how much you try to stay organized, the mess can still accumulate very quickly. It’s better to be prepared and have a convenient way to hide it away. Curtains will do just that so they’re very useful. For those who aren’t too concerned about the budget, take a look at this inspirational walk-in closet. Just from a quick glance, you can feel a powerful luxury vibe considering the premium materials used and the elegance of the mirrored closets. 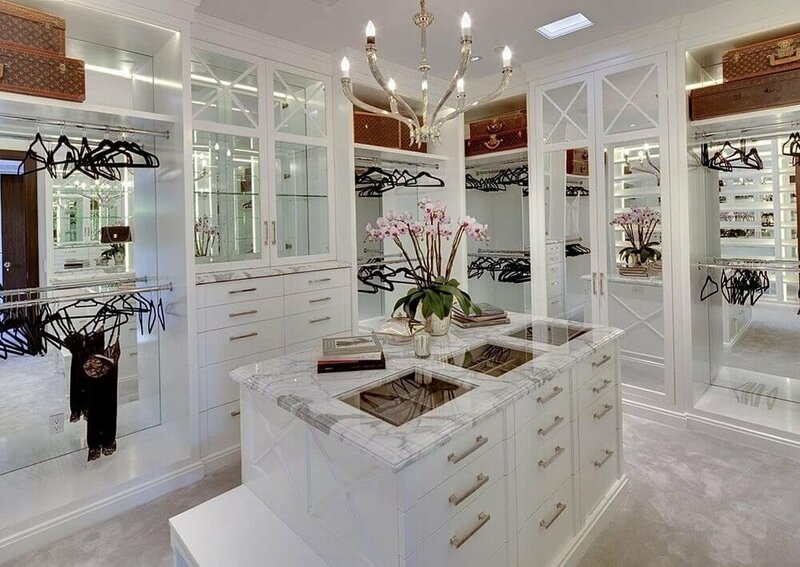 The beautifully crafted dressing island is one of the most imposing elements of this walk-in closet, followed closely by the elegant chandelier. The vintage suitcases also have a nice decorative effect.